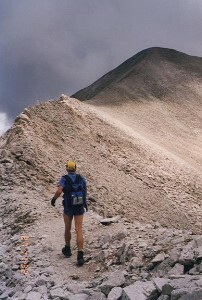 Jared Campbell descends Mount Princeton during a Nolan’s 14 attempt in August. Photo by Matt Hart. As Jared Campbell stood at the base of Tabeguache Peak, his thirteenth summit in a bid to climb fourteen Colorado fourteeners in a single sixty-hour push, there was only one thought he could piece together amid a swirl of fatigue and confusion — the climb. It was so much bigger than he imagined it would be. A line of boulders, scree, and alpine tundra seemed to stretch beyond the sky. The route was clear but his condition was increasingly murky. His heart rate and breathing felt too rapid for the limited mechanical output he could muster, and his body’s thermal regulation fluctuated wildly without regard for the outside temperature. Whether it was hot or cold, he couldn’t tell, and whether he was simply tired or potentially dying, he couldn’t know, but he did understand one simple idea — he needed to keep climbing. One push up to Tabeguache, elevation 14,162, and other one to Mount Shavano, elevation 14,229, put Campbell and his partner, Matt Hart, at their finish line — a mostly empty parking lot with only their small but dedicated crew to cheer them in. It had been 58 hours and 58 minutes since they set out to conquer this route in the Sawatch Range of the Colorado Rockies, this achievement that few have heard about and exponentially fewer can understand — Nolan’s 14. Gordon Hardman approaches the summit of Mount Antero during the first official Nolan’s 14 attempt with Blake Wood and Fred Vance in 1999. The three completed seven summits in 34 to 46 hours. With no stipulations besides traveling by foot and finishing in fewer than sixty hours, only seven people have achieved the status of Nolan’s 14 finishers in its twenty years of existence. Mike Tilden of Utah, Blake Wood of New Mexico, and John Robinson of Oregon cracked the sixty-hour barrier in August 2001, and Robinson came back to set the “course record” in 2002, which still stands at 54 hours and 57 minutes. Although several mountain runners came close with twelve or thirteen summits — including women Ginny LaForme of New Mexico and Betsy Kalmeyer of Colorado — no one cracked the fourteen-piece puzzle for a decade, until this year. Three runners — Campbell and Hart, as well as Colorado runner Eric Lee — brought the number up to seven. All told, it’s about a 15 percent finisher rate. 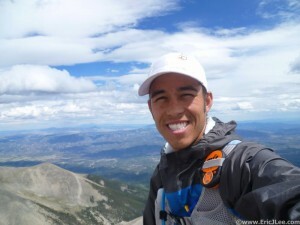 Eric Lee takes a self portrait atop Mount Shavano. 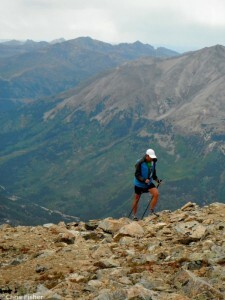 Lee tackled the route with single-minded focus, setting his starting date for late August and dedicating his entire year of training to the goal. He had already scouted the route in pieces, achieving four summits in 2008, five in 2009, and nine in 2011. 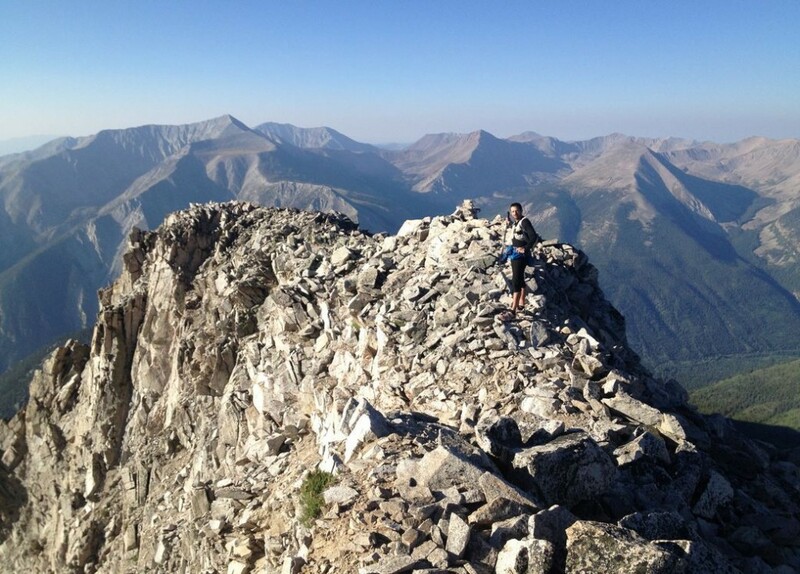 Between Jan. 1 and Aug. 5, he ran or hiked 1,800 miles with 500,000 feet of elevation gain. For the rest of the month he tapered, studied, and planned. At 6 a.m. August 31, he set out from the Leadville Fish Hatchery, en route to his first peak, Mount Massive, elevation 14,421. He had a small crew at road crossings and a few friends to accompany him on some of the peaks, but in keeping with the aesthetic of the event, he always hiked or ran in front, and often alone. In his trip report, Lee describes a moment in the pre-dawn hours of day two when he had to decide whether to attempt a rugged bushwhacking route toward Mount Harvard in the dark, or take a nap and wait for daylight. Eric Lee ascends La Plata Peak. Campbell and Hart’s journey wasn’t without mishaps. They mapped out a route that was around ninety miles and initially aimed for a 45-hour finish, starting on Aug. 17. Hart felt weak in the early stages of the route, and Campbell became sick later. 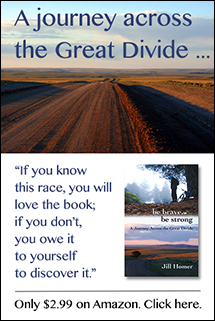 Their planned route proved to be unworkable in places, and they found themselves tacking several miles onto several summits when they had to deviate to find a better way, which set them increasingly behind their planned schedule. At least once, they ran out of food and water for hours before reaching their crew. They took two planned naps, each less than two hours. Approximate elevation profile of Matt Hart and Jared Cambell’s Nolan’s 14 route. Campbell and Hart’s route ended up being about 104 miles, with about 46,000 feet of elevation gain. Lee managed a reported 91.5 miles with 47,000 feet of elevation gain. Many of the specifics of their journeys are described on Campbell’s and Lee’s trip reports, but only a skilled navigator with knowledge of the region would have any chance of retracing their routes. And through it all they’d have to manage supplies, crew schedules, nutrition, weather planning, safety, and rest. That’s the true challenge of Nolan’s 14 — it’s not only a physical unravelling; it’s also a logistical nightmare. But therein lies the intrigue, and the likelihood that more mountain runners and skilled hikers will attempt Nolan’s 14 in the coming years. With a stunning route, a pure mountain line, a minimally supported ethic, and a truly monstrous physical effort, there is much about Nolan’s 14 to appeal to those looking for a life-altering challenge. Information about Nolan’s 14 is available at Matt Mahoney’s Web site, http://mattmahoney.net/nolans14. Jill, thanks for the nice write up, I think you did a wonderful job portraying all that Nolans14 embodies. In short, its one hell of a journey.